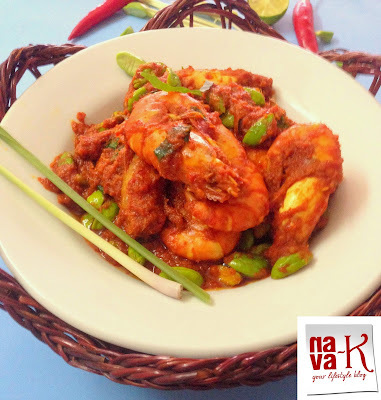 Sambal Goreng Udang Pete basically is, Prawn Petai Sambal and petai in Indonesian language is known as pete. Pretty much the pod beans from the flat and bulging in the centre part long beans. The bulge is where the pod beans are in and which you need to remove. Or for easy cooking, just buy the pod beans in packets. My take all the time instead of doing the removing of the pod beans from the long beans. 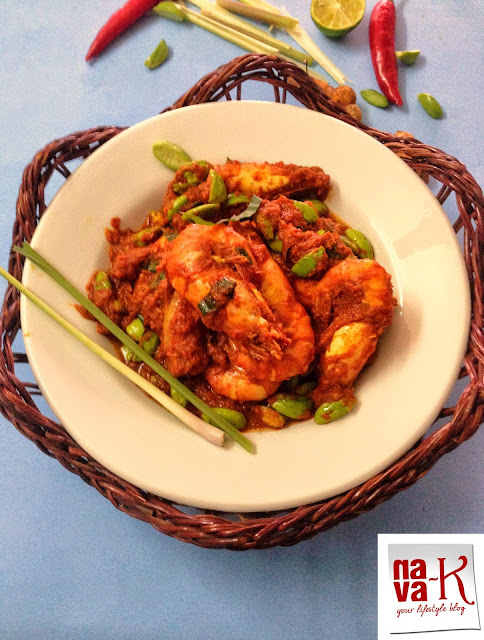 This sambal goreng udang pete is the Indonesian style. Of course, I have previously rolled out a couple of our Malaysian petai recipes (Sambal Petai Ikan Bilis, Sambal Sotong Petai, Sambal Udang Petai)? Remember? Can you recall (Sambal Tumis Bilis Petai, Sambal Petai Udang Kering & Sambal Bilis Petai)? What's with an Indonesian style petai and prawn sambal. I don't have a specific answer. Honestly. Maybe I thought? Since I quite know about Indonesian style of cooking, why not (Terong Balado, Sate Kambing, Indonesian Grilled Fish, Sambal Goreng Teri, Ikan Balado & Sambal Terasi)? 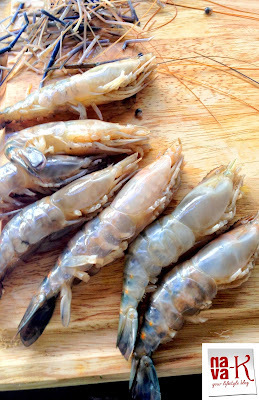 How do we make this Sambal Goreng Udang Pete? Easy. 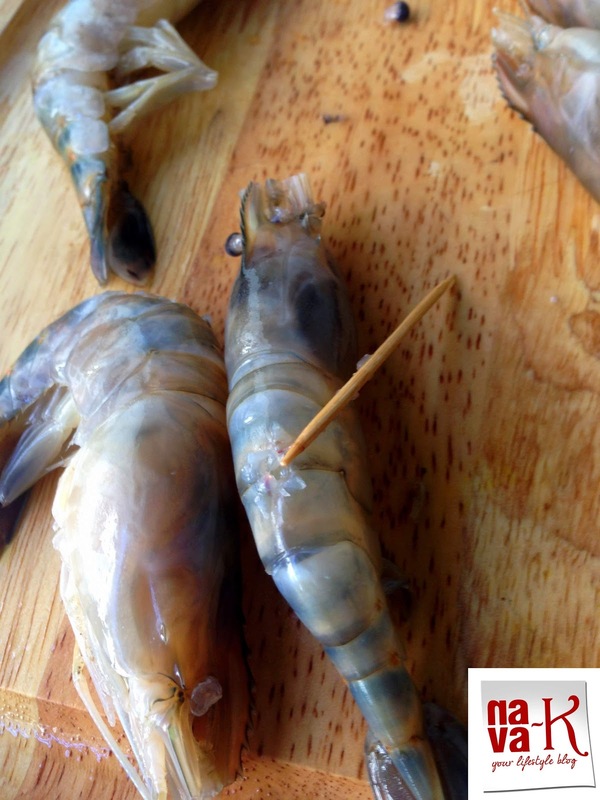 But cleaning of prawns? Some of your time taken. 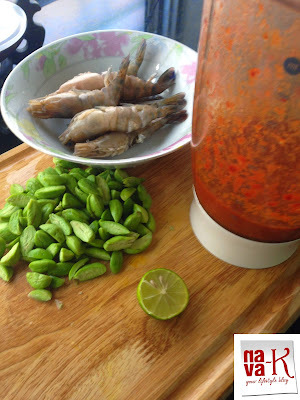 Other than that, the blender or food processor or you like to do the banging in the mortar, for the sambal paste, and thereafter, we will cook. Sambal Goreng Udang Pete! Mouth loving. Walla! I won't mind vouching, the Indonesian fab spicy dish and the scent of fresh turmeric (Ikan Goreng Kunyit) and turmeric leaf? Utterly wondrous. 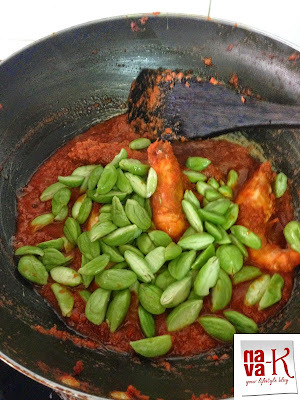 1 packet petai/stink beans - cutting into two is advisable because sometimes there can be creepy crawlies inside. 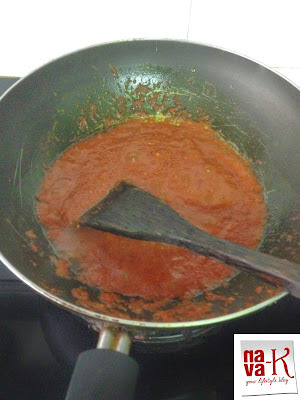 Heat oil and when heated, add chilli paste. Add prawns and season with salt. 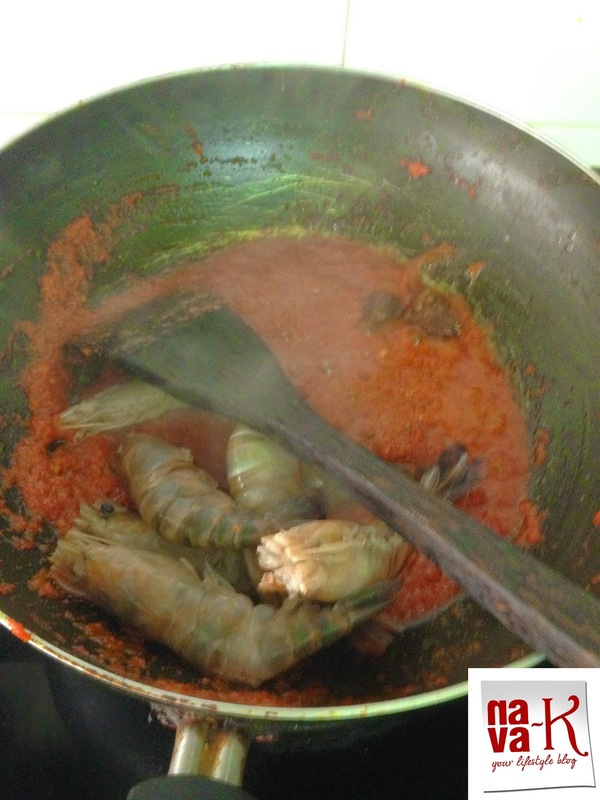 Simmer and cook to cook prawns. Add petai, turmeric leaf and lime juice. Stir to combine in and dish out. (Note: can add petai earlier to cook for a texture you prefer. We like it quite raw). This looks fantastic!! We usually have petai in chutney form but this is something I'll definitely try out. Beautifully presented! I do not eat to much spicy food but this looks delish. These prawns look delicious! And I'm the same with the photos! With the number of stepwise pictures I take, I'm lost most of the time! 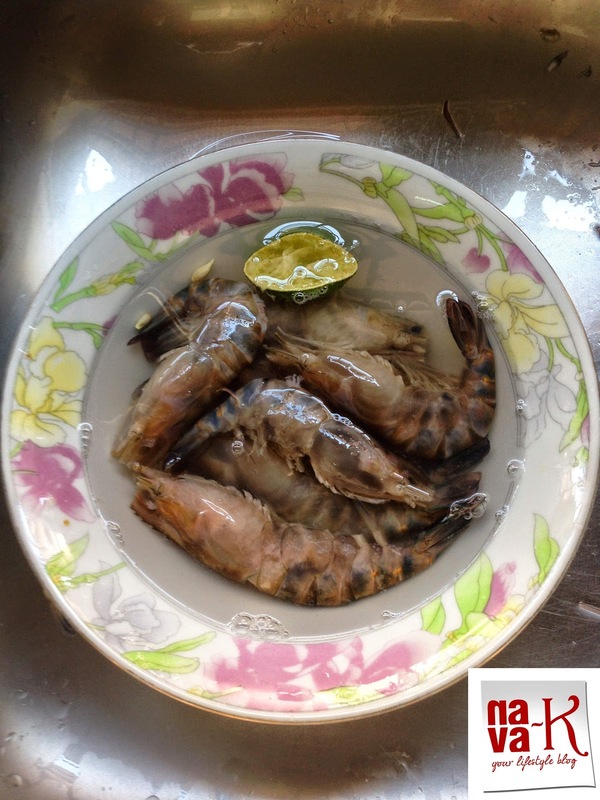 Those prawns are fresh and flavourful! Those stink beans sound really interesting. Easy and yummy dish, kunyit is not available here. dear mam, do i need to soak the petai or i can straight away put the petai together ? Vellachamy - no need to soak the petai. Just rinsed and as said, simmer to soften to a texture you like.